Please note: Open Box models come in a brown box with one magazine. 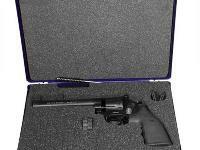 Read more about the Smith & Wesson 586 in Dennis Adler's Airgun Experience Blog. 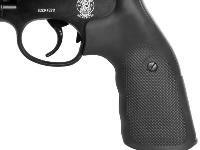 If you seek realism in an air pistol, this is the one to get! The S&W 586 revolver functions and feels like the firearm. Shoot it double-action or single-action. The crane swings out and the removable pellet clip is on the end of it. Fill it up, close the crane and commence to shootin'! There's an extra 10rd clip included, plus a total of 3 front sight blades. One is already attached to the gun. The blades are different widths. This allows you to use the width that you feel best helps you get the most accuracy. Things I liked: TRIGGER IS VERY GOOD IN SINGLE ACTION AND ADJUSTABLE SIGHTS ARE A PLUS. i DO SHOOT DOUBLE ACTION AT KNOCKDOWN TARGETS APPOX 7 YDS AND ACCURACY IS VERY GOOD. HAVING 10 ROUNDS IS A PLUS. 50 ROUNDS IS MAX FOR 10 YDS BUT AT SHORTER RANGES 60 IS OK. THIS IS NOT A BULLSEYE SHOOTER AND I DON'T SHOOT JUST TO PUNCH HOLES IN PAPER. IT IS A LOT OF FUN SHOOTING WIFFLE BALLS, PING PONG BALLS AND OTHER NON PAPER TARGETS. ONE YEAR OLD AND HAVE OVER 5,000 ROUNDS WITH NO PROBLEMS OF ANY TYPE. GREAT GUN FOR A PLINKER !!! Things I liked: It looks like and feels like the real thing. Trigger pull in single action is not bad, and double action is surprisingly good. You can even stage the trigger. Things I would have changed: Better accuracy would be nice, but this is not a target gun. 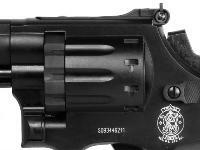 What others should know: If you have never owned a CO2 gun the owners manual could be better. You get about 40 shots from a cylinder. Be aware the gun has a propensity to jam. 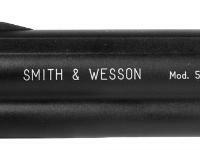 (Pellet between barrel and clip) UMEREX suggests not using crossman CO2 cartridges. 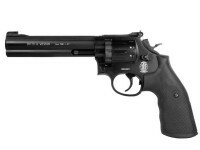 Things I liked: Weight feel and trigger pull just like the real S&W .357 Revolver. 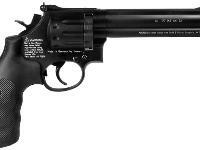 This is without a doubt one of the finest pellet replica pistols for this particular gun anywhere. Everything on this gun is absolutely accurate to the real steel.I'm very proud I purchased this Pellet Revolver no doubt! I bought this gun from pyramid air about 6months ago and very happy I did.I am confident this pistol was worth every penny spent. Things I would have changed: I wouldn't change a thing as far as I'm concerned. Will this humanely kill a chipmunk? No you would need something with more range (like a rifle). No, it kind of feels like powder coat with a matte finish. Description states black matte finish.